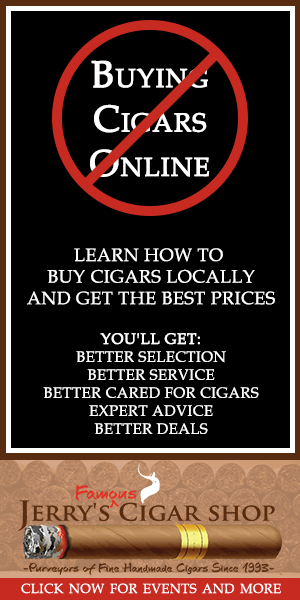 Wanna Save Money & Buy Your Cigars Locally? If you are into cigars, you know it is a wonderful hobby, but can get expensive. Most folks think that you can get the best deals by shopping online and that local cigar shops can't compete with the big websites. For most local cigar stores, that is true, but not at Jerry's! We have tremendous buying power and solid relationships with some of the top factories in the industry. That lets us take advantage of deals that most cigar shops don't get, and we can pass those savings on to you. When you buy cigars online you are taking a real gamble and the lowest price is not always a great deal if you end up getting cigars you don't really care for, or if they have construction flaws. A dirty little secret about buying cigars online that most folks don't know is that often times factories will send cigars that have some defects or imperfections to the big online dealers to push products out at discount prices. If you end up buying an assortment of cigars online for about $4 per cigar and only like half of them, did you really save any money? You basically spent $8 per cigar for the ones that you actually enjoyed. When you buy from Jerry's, we can pair you up with the perfect cigars to match your budget and your palate, so you are only buying winners! The other thing to consider when thinking about buying online is that your cigars usually have to travel on a UPS truck for up to 4 or 5 days before they land on your doorstep, which can mean cracked wrappers due to lack of proper humidification and temperature control. You can avoid all of that by buying at Jerry's. On the rare occasion that you might get a cigar with a tight draw or some imperfection, we will happily replace it for you with a smile. Our cigars have been resting (some for up to 2-3 years) in our 24/7 climate controlled, humidified cigar storage areas, so you know your sticks will be in perfect condition when you light one up. When it comes to cost savings, our generous "Jerry's Bucks" reward program can't be beat! For every $50 you spend on a single transaction you will automatically get $5 back in Jerry's Bucks, which comes out to around 10%. On top of that, whenever you buy any 25 premium cigars at a time, we give you an extra 10% back in Jerry's Bucks, so you can stack your discounts to save around 20%. The smart cigar enthusiast can save even more by signing up for our locker program for only $29.95 per month & EVERY MONTH WE GIVE YOU BACK $15 IN JERRY'S BUCKS REWARD CARDS...so the lockers essentially only cost you $14.95/mo...(a ridiculously low 50cts per day). Locker members save 10% off any store purchases all year round (single cigars, beverages, accessories, etc...) and 20+% off whenever they purchase 25 total cigars. By combining locker discounts with our generous volume based reward discounts, locker members save an average of 30+% off when they purchase 25 cigars. On some higher end brands like Padron, Fuente, Davidoff, La Flor Dominicana, etc...the online stores are not allowed to discount those brands. So if you like the classics or enjoy higher end boutiques, our reward program actually beats the internet sites hands down! We also don't make you commit to a full box of one brand, wrapper and size to get your discount. We let you mix and match any 25 premium cigars in any brand, shape, size or wrapper variety to qualify for the "box" discount. That is another great thing about shopping at Jerry's, you can still save while having the freedom to essentially create your own box deal...and you can get these deals every day at Jerry's, you don't have to wait to catch some once in a blue moon sale online to save money. When you stack up all of our reward programs, expert advice, freedom to create your own assortments and the ability to enjoy your cigar in one of our comfortable lounges, we think you will find that Jerry's is actually a far better value than trying to search out a maze of online deals only to end up with questionable cigars. The lowest price is not always the lowest cost! You can contact us at 850-385-9669 (Original Sharer Rd location) or at 850-894-3696 (New Kerry Forest Pkwy location) or stop by either location to check out our amazing selection. Be sure to ask one of our knowledgeable cigar experts for more information on how we can help you keep this wonderful hobby affordable. *Your email address will not be published. Required fields are marked.